Acting Labour leader Harriet Harman says the party rules should change so half the shadow cabinet are women. Ms Harman told the Unite conference in Manchester it was time for Labour women "to step out of the shadows". 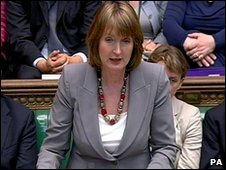 "Labour is the only party in Parliament which speaks up for women in this country," Ms Harman said. Leader hopeful Ed Miliband said shadow cabinet rule changes were up to Labour MPs but he was "very sympathetic" to the idea and would "be supporting it". In her speech, Ms Harman said the party had more women MPs than all other parties added together but still had twice as many male MPs. "We have some excellent experienced women and some brilliant new women MPs. The Labour men are great - but they are not twice as good as the women." Labour MP and leadership contender Diane Abbott told the BBC's Question Time - in an edition to be broadcast later on Thursday - that the idea was "certainly worth discussing". "I think we have to do something to break the stranglehold of people who all look the same at the top of our party," she said. "We have a boys' club at Westminster. It is fishing in too narrow a pool." Ms Harman said the contest to elect a leader to succeed Gordon Brown was a "crucial opportunity for the Labour Party to reflect, renew itself and re-engage with the people of Britain". "The contest will be open engaging and energising. It will be a chance to invite supporters to join the party to have a vote. Our biggest loss of support was from hard-working families who, worried about housing and jobs, felt insecure and concerned about immigration. "Now there is our chance to debate these issues throughout the party and through the contest for the next Labour leader." Around four million people will be able to vote in the Labour leadership election - the majority of them union members, but also anyone who is a party member by 8 September. David Miliband, Ed Miliband and Ed Balls have all got enough backing from Labour MPs to enter the contest proper, with Andy Burnham, John McDonnell and Mrs Abbott all yet to get 33 MPs to nominate them. Ms Harman said Labour's opponents would try to "denigrate" the party's record in government, but "we will not let them". "For every child who, instead of being cooped up in a flat, is playing in a brand new children's centre, that is our legacy. "For every patient who instead of waiting in pain is cared for by doctors and nurses in a brand new hospital, that is our legacy. "For every villager in Africa whose life has been transformed by cancelling third world debt, that is our legacy." Harriet Harman says Labour will be "fortified" by its new leader, after a "roller coaster of emotions", as she closes the party's conference. Labour leader Ed Miliband has set forth the changes he'll make as the optimistic new guy in charge, writes BBC deputy political editor James Landale.